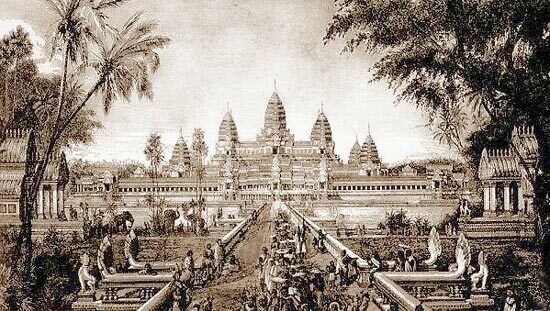 Angkor Wat history, with its unique relics, has long been represented a prosperous culture of Cambodia. Angkor Wat attracts thousands of visitors a year thanks to its legendary history and the stunning settings. You will be overwhelmed by the magnificent temples and the timeless beauty of the walls here. But there are a lot more facts of Angkor Wat history lying behind this massive temple system which you might not know about. Angkor Wat history was legendary. The temple complex, built from the 9th century to the 15th century in Kulen mountain, was the capital of the Khmer empire. Until now, the most famous spot of the Angkor complex is Angkor Thom with the well-known Bayon temple carved a giant smiley face. 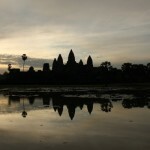 The second popular spot is Angkor Wat, then next are smaller temples such as Ta Prohm, Preah Khan, Pre Rup and Ta Nei. The main temple of Angkor Wat has 398 room with gorgeous stone carving on ceilings, corridors, handrails etc. 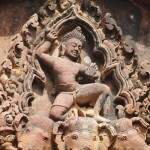 which shows extraordinary sculptural skill of the ancient Khmer. The most stunning sculptural decoration is the bas-relief on the wall of the first floor’s corridor. This can be seen as the largest stone carving sculpture in the world – with 2.5 meters high and over 800 meters long. The second floor has numerous paintings of Apsara dancer, which is the symbol of Cambodian culture. The third floor consists of two cross corridors, and the intersection was the center of Angkor Wat. Formerly, there was a golden Vishnu statue here, but it has been stolen. The Angkor Wat complex has been abandoned mysteriously in the 15th century, and a large area of this sacred city was covered by jungle before being discovered in the 19th century, and then became a famous World Heritage. Some remote and less touristic areas such as Beng Mealea temple – located 52km far from Siem Reap – and Koh Ker archaeological site – about 120km far from Siem Reap are also small cities among the giant system of Angkor. 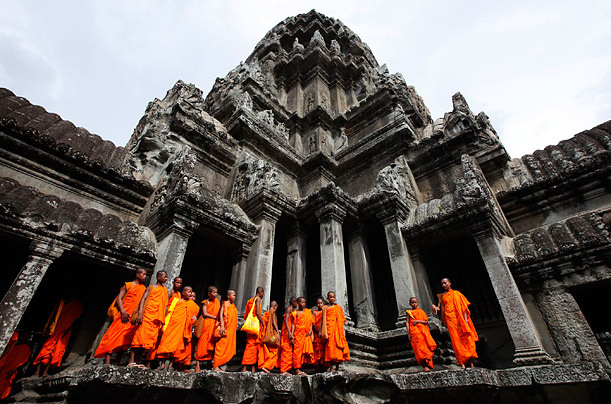 Monks, at the foot of an Angkor temple, will tell you more about Angkor Wat history and a lost empire in Southeast Asia. Being built at the beginning of the 12th century (between 1113 and 1150 B.C), Angkor Wat is considered a religious monument and the largest preindustrial city in the world. Angkor Wat history also has one special thing: it is the only mountainous temple in Cambodia that has the main entrance in the west, which goes against the architectural standards of that time. According to Hinduism, the west symbolises death. Until now, archaeologists haven’t figured out why the ancestors have chosen that direction. Angkor Wat is a tribute to Vishnu god – a Hindu god, and not to worship the king of Khmer empire. The bricks used to build the temple were bound together not by mortar, but by a colourless mixture made from plants. The temple was built based on the principle: put the stones together first, then make the sculptures. You can see the proof lying in some pillars at the first floor: there’re still traces of unfinished sculptures. A day trip to Angkor Wat will cost you US$20, a 3-day trip will cost you US$40; but if you stay there for a week, you just have to spend US$60, which is very cheap. So if you don’t have time limit, just stay longer and discover more.